Capacitive transducer is a measurement device in which variations in pressure upon a capacitive element proportionally change the element’s capacitive rating and thus the strength of the measured electric signal from the device. As we know here the capacitance of the transducer varies with respect to the external stimulas. 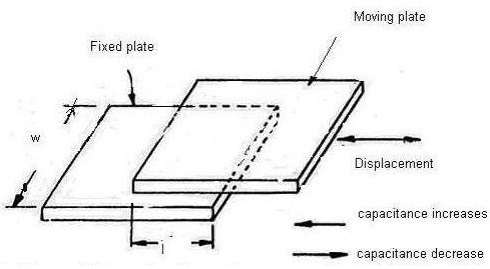 Normally a capacitive transducer uses a stationary plate and a movable plate. The stationary and the movable plates are separated by aair or vacuum dielectric. The movable plate changes its position under the influence of an external stimulus. 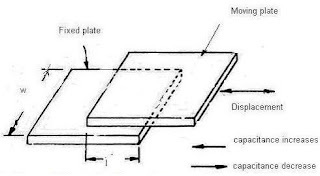 As we know the capacitance depends on the area of plates, the movement of plate causes a change in capacitance. This is the basic working principle of a capacitive transducer. Compared with optical, piezo-resistive and inductive transducers, capacitive transducers have many advantages. 7. They require very little force to operate..
1. The performance is severely affected by dirt and contaminants as they change the dielectric constant. 1. It is mainly used for blood pressure measurements. 2. Also used for displacement or position measurement. 3. They can detect motion, acceleration, flow and many other variables. 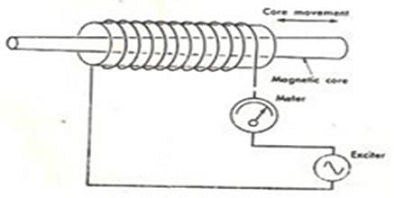 The inductance of a coil can be changed either by changing its physical dimension or by changing the effective permeability of its magnetic core. In transducers using inductive elements we normally use the second principle. The effective permeability can be changed by moving a core, which is having a permeability higher than, the air through the coil. But the disadvantage with basic type of inductive transducer is that the inductance of coil is not related linearly to the displacement of coil if large displacements occur accidently. It is to avoid this disadvantage that we use LVDTs. The existing inductive transducers have a relatively small output power and often require amplification of their outputs. A transducer is a device that performs the conversion of one form of variable into another. Normally in biomedical applications, the transducer input is in non-electrical form and the output will be in electrical form. Actually transducers and electrodes are a part of a group of devices called sensors. Major difference between transducers and electrodes is that transducers make use of some transducible element for the measurement. But the electrodes directly measure the signals. A sensor means a device used to measure a particular parameter either by changing the desired signal to electrical signal or by changing ionic flow into electron flow. An active transducer is one which gives its output without the use of excitation voltage or modulation of a carrier signal. One property of active transducer is that it converts non-electrical energy into electrical energy and vice-versa. 1. These type of transducers are used in electromagnetic flow meters to measure blood flow. 2. Also used in heart sound microphones. Piezoelectricity is the ability of some materials to generate an electric field or electric potential in response to applied mechanical stress. The effect is related to a change of polarization density within the materials volume and is also reversible-means the production of stress or strain when an electric field is applied. A piezoelectric crystal (such as Quartz) can produce a voltage under deformation by compression or tension. This is called piezoelectric effect. This effect is the basic working principle of piezoelectric type transducers. So they convert displacement or pressure into an electrical variable. Mainly used in pulse sensing measurements. Photoelectric effect is the ejection of electron from a metal or semi conductor surface when it is illuminated by light or any other radiation of suitable wavelength. So a photoelectric transducer generates electrical voltage in proportion to the radiant energy incident on it. These types of transducers are based on the seeback effect. It states that when two junctions of a thermocouple are maintained at different temperatures, an emf is generated which wil be proportional to the temperature difference between the junctions. Thermocouples are widely used type of temperature sensor for measurement and control. They are inexpensive, interchangeable and are supplied with standard connectors and can measure a wide range of temperatures. Also we can use thermistors as active transducers. Here its resistance value changes with change in temperature. The material used in a thermistor is usually a ceramic or polymer. Disadvantages: Thermistors are unsuitable for wide temperature ranges, Less stable at high temperatures, Non-linear temperature-resistance curve. 2. In biotelemetry systems to measure temperature. Passive transducers convert the physiological parameter (such as blood pressure, temperature etc) into an electrical output using a DC or AC excitation voltage. One important property of the passive transducers is that they are not reversible. Passive components such as resistors, capacitors, inductors are used to make the passive transducers. They require an external power to operate and the output is a measure of some variation in the passive components. 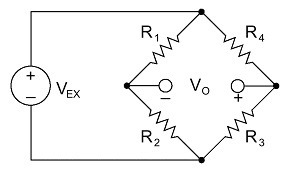 Many transducers make use of the principle of Wheatstone bridge. In many biomedical transducers using Wheatstone bridge, all four resistances are equal under balanced condition. The balanced condition is varied when any of the resistances varies. Normally during the measurement, it is designed in such a way that the resistance value of a particular resistance varies and hence balance is lost. By analyzing this change in resistance, the parameter can be measured indirectly. An oscilloscope is previously called as an oscillograph. It can be informally known as a scope, CRO (for cathode-ray oscilloscope), or DSO (for the more modern digital storage oscilloscope). It is a type of electronic test instrument that allows observation of constantly varying signal voltages. The output of a CRO will be usually as a two-dimensional graph of one or more electrical potential differences using the vertical or y-axis, plotted as a function of time (horizontal or x-axis). Many signals (e.g. sine, cosine etc) can be converted to voltages and can be displayed this way. By changing the mode of CRO into transfer characteristics, we can see the transfer characteristics of signals. The transfer characteristics of a signal give the variation of the output wave with respect to the variation to the input wave. The Signals may be either periodic or repeat constantly, so that the multiple samples of a signal which is actually varying with respect to time can be displayed as a steady picture in the CRO. Many oscilloscopes (storage oscilloscopes) are able to capture non-repeating waveforms for a specified period of time, and are able to produce a steady display of the captured segment. Oscilloscopes are mainly used to observe the correct wave shape of an electrical signal. Oscilloscopes are usually calibrated so that the two axes voltage and time can be easily read as well as possible by the eye. This will yields to the measurement of the peak-to-peak voltage of a waveform. It also allows checking the frequency of periodic signals, the time between pulses, the time taken for a signal to rise to full amplitude, which is usually called as the rise time, and relative timing of several related signals. The applications of Oscilloscopes are in the fields of sciences, engineering, medicine, and telecommunications industry. For the maintenance of electronic equipment and laboratory work, general-purpose instruments are used. Special-purpose oscilloscopes are used for analyzing an automotive ignition system or to display the waveform of the heartbeat as an electrocardiogram. If we consider some practical example, some computer sound software allows the sound being listened to be displayed on the screen as by an oscilloscope. Thus CRO can be used in many applications in the emerging world technologies. Most of all, the CRO can be considered as the eye of an electronic engineer. In other words an electronic engineer cannot see his outputs without the help of a CRO. Some special storage CRTs are used to maintain a steady display of a single brief signal in case of advanced storage oscilloscopes. By digital storage oscilloscopes (DSOs) with thin panel displays, fast analog-to-digital converters and digital signal processors, CROs were later largely outdated. DSOs without integrated displays are known as digitizers. Digitizers are available at lower cost, and it uses a general-purpose digital computer to process and display the required waveforms.